Miller Funeral Services & Cremation Society of Texas features a beautiful, serene, professionally decorated room where you may receive friends and family after the services for your loved one. For a place to unwind and have a cold drink or something to eat, there is no need to look any farther than our Celebration of Life House. 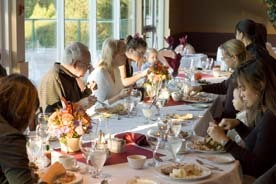 Our caterers offer a wide selection of breakfast, lunch, or dinner menus suited to each family’s taste and budget.